He has been producing stencilled graffiti boards in the style of Banksy for many years and this is a continuation of the theme for Holy Week. I’m fortunate to have several of his pieces in my house. Check it out! If you hadn’t guessed, he came up with the Rock Mass logo. they are rather simpler than the tattoos! 😀 I don’t think I’ll have a problem with that! I’m intrigued as to what form they will take and whether they will have words as well as images. I’ve just done a set in conjunction with an artist friend as a digital download for Wild Goose Publishing and I really enjoyed the whole process: It was the first time I’d done a collaborative visual/word project on such a scale and I found it opened up a whole new set of perspectives for me on the Stations. So I’m really looking forward to seeing yours and thinking about them as part of my own Holy Week journey. Do you have a link to the wild goose ones Pat? They’re at http://www.ionabooks.com/2380-PL10244-Stations-of-the-Cross.html but I’m afraid there’s a charge to download – though it is only a very modest amount (£3.20 + VAT) and for that you get a full size set, a prayer card sized set, a set of the words and some notes with guidance on how to use them. You can preview one at WG site, along with information about the project – or there is one posted to my facebook page. Basically it’s 14 oil-pastel life-form drawings focussing on the figure of Christ with a reflective haiku woven into each image. 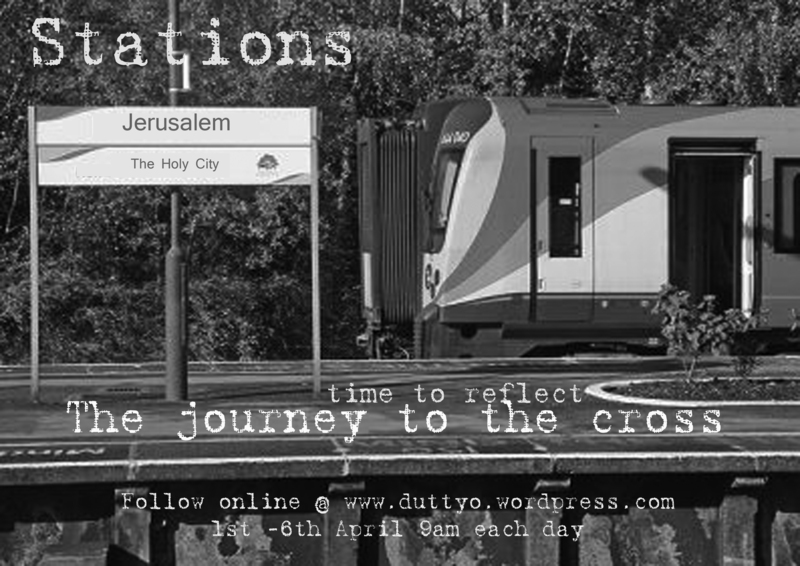 The original idea was to make a set for people whose circumstances did not allow them the time to attend a traditional stations service (hence the very economical format) and it developed from there. Mine include the sections of scripture that inspired me to use each image. I actually didn’t originally intend to use them online, they were created for a service in one of my churches where they’ll be displayed with people invited to come and view them and spend time in reflection over the images and words. I keep thinking that there should perhaps be more to it than that but I’m resisting the urge to over-complicate so far! That sounds like a good impulse to me duttyo – it’s all too easy to over-egg the pudding isn’t it? Or at any rate – that’s certainly my experience. Which is why having a good and properly critical editor is such a boon!